Birds and humans are related, but most people would regard that relationship as you would a distant cousin you don't talk about any more. Singing is a different kettle of fish, it seems. 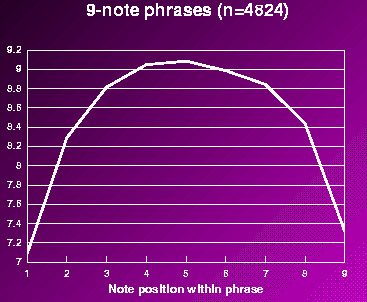 While common patterns in music include phrases that rise then descend (melodic arches), or just have their final note elongated, constraints on the vocal system are likely to have affected them. Canadian Frank Russo, Dr. Adam Tierney from NW University, Illinois and Californian, Dr. Aniruddh Patel have expertly examined origins of song structures . The trick here is that they have used both songbirds and humans. They imagined motor constraints causing similar animals to adopt similar melodic shapes. With a different method of sound production, animals should have totally different melodic shapes. These two species have evolved similar structures in their vocal apparatus by convergent evolution rather than any direct relationship. Using 32 human folk areas and 54 songbird families, 250 million years of evolution seem a mere whisper. The trio discovered common behaviour producing the phrases called melodic arches. They are found when birds take a breath between each note, then create each note as a melodic arch. Below is a typical melodic arch from a Western folk song. (It's possible that "arches" is a misnomer, as there could be more complex underlying patterns, but such a negative approach is not the method to solve this problem without even deeper research). Humans behave similarly to birds, although often expelling more than one note when they exhale of course. In the same way, the detailed research found that the extension of the final note is also common to songbirds and humans. While humans commonly complete a phrase with a long note, birds too produce a long final note because of the nature of their active vocal tract. If we were to study any animal with a passive sac used to vocalise, there should be no extended final note. The research also indicates that frogs do not produce extended final notes, presumably because they have a passive sac used to produce the air for their vocals. Humans and songbirds can, we urge, resume their precarious double act as songsters of legend and myth with singular gusto!